ALEPPO, SYRIA – Not a week after the major breakthrough the Syrian Armed Forces accomplished in Hnano Housing District that had them capture all the east Aleppo districts that lay north of the Al-Bab Highway, the Syrian Army would proceed to launch its second phase of the Aleppo offensive. Starting with the Ma’asaraniyah Youth Housing Complex and the Research Housing district that lie directly west of the Aleppo International Airport, the aim of the second phase is the seizure of the entire region between the Al-Bab Highway and the road that connects the international airport to the Ancient Citadel cresting the heart of Syria’s largest city. Within a matter of days, the Syrian Arab Army succeeded in capturing the districts of Karm Al-Jazmati, Karm Al-Tarrab, Dahret Awad, Karm Al-Maysar, Karm Al-Tahhan, Karm Al-Qaterjy, Tariq Al-Bab, and Halwaniyah almost surrounding the rebels entrenched in Sha’ar and Bab Al-Hadid districts. With no more than 500 meters separating the elite Tiger Forces at the Eyes Hospital and the garrison of the citadel, the rebels are expected to abandon their holdouts in the Old City neighborhoods north of the citadel or risk further isolation in the city. There comes a point when Reality cannot be ignored. 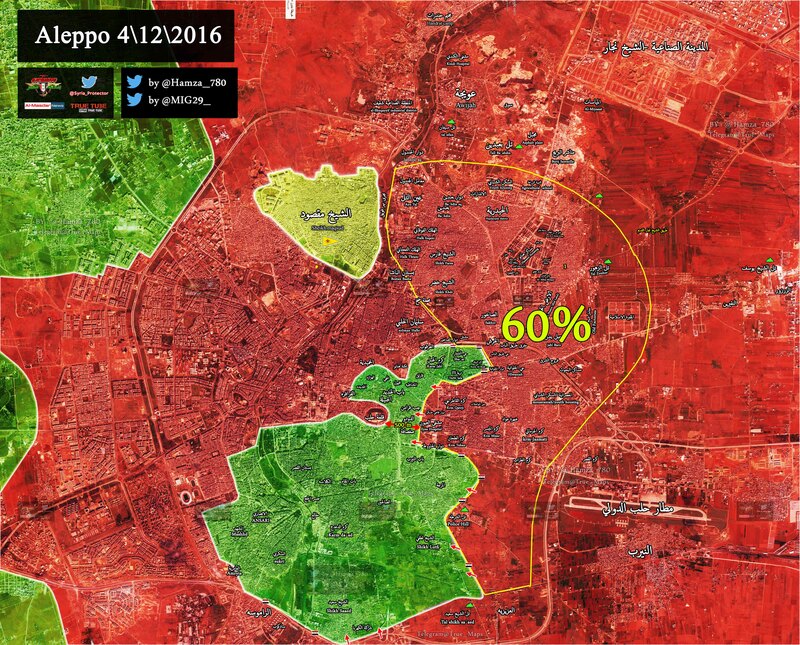 With SAA closing in the frontline is shrinking in big steps with more and more SAA/NDF freed up for from the defensive lines around west Aleppo. With the reaching of the citadel, the fighters stationed there can move towards defending the other end of the west aleppo frontline. As 2 days ago, it was stimated that only 900 shithadists were left, 100% will happen sooner than anyone thought.